WHAT IS LAYERED LEARNING FOR CLASSROOM GUITAR? 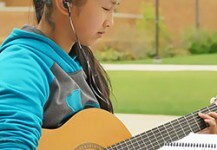 So what is layered learning for classroom guitar? 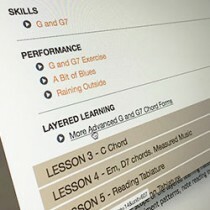 Layered Learning tm or differentiated instruction, as it’s referred to in academics, is one of the major teaching advantages provided in the Consonus Curriculum for Classroom Guitar. Many lessons presented in the Consonus Online Learning Site has it’s own Layered Learning component which presents alternate advanced versions of the skills that are taught in that particular lesson. This means that more experienced students can be challenged while other students learn and perform the standard lesson material, and the class progresses at the same rate. The scope of the layered learning material ranges from chord forms and voicings, accompaniment patterns, note reading in positions, and more. In an effort to help with funding, we would like to contact the person (administrator) that approves your budget (optional).